Schematic representation of ligand binding sites on CD54 and epitope representation for Mouse anti Human CD54 antibody, clone 15.2 (MCA1615). Effect of blocking of ICAM-1: ligand interaction by Mouse anti Human CD54 antibody, clone 15.2 (MCA1615GA) on Ifn-γ production by NK cells in vitro. Engagement of ICAM-1 with its cellular ligand but not with PfEMP1 is required for NK cell IFN-γ production. (A) Diagram of an ICAM-1 molecule showing schematic binding sites for LFA-1, Mac-1, CD11c/CD18 and PfEMP1. The epitope map of the anti-ICAM-1 mAb 15.2, My13 and RR1/1 is indicated. (B) Human PBMC were cultured with uninfected RBC (RBC, black bars) or with RBC infected with the 3D7 Pf strain (3D7, grey bars) in presence or absence of antibodies directed against NKG2D (isotype control), ICAM-1 or CD18. Three different clones of anti-ICAM-1 were used: 15.2 blocks the interaction of ICAM-1 with LFA-1 and with PfEMP1, RR1/1 blocks only the interaction with LFA-1 and My13 blocks only the interaction with PfEMP1. After 24 h of co-culture, NK cell activation was analyzed by flow cytometry by gating on CD3−CD56+ NK cells. 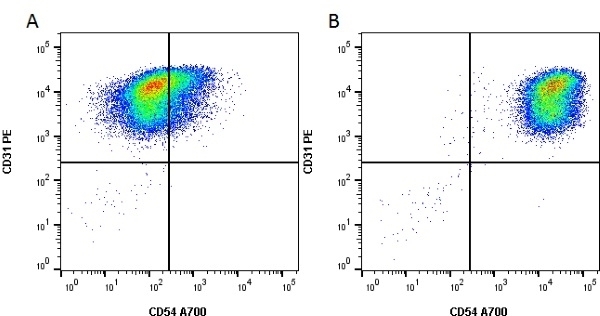 The CD69 MFI staining on NK cells (left panel), the percentage of CD25+ NK cells (middle panel) and the percentage of IFN-γ+ NK cells (right panel) were determined for 24 donors (None, NKG2D and 15.2), 13 donors (CD18), 9 donors (My13) or 5 donors (RR1/1). Means ± SEM are represented. Statistical analyses were performed using the Mann Whitney test. Dissection of the Role of PfEMP1 and ICAM-1 in the Sensing of Plasmodium falciparum-Infected Erythrocytes by Natural Killer Cells. 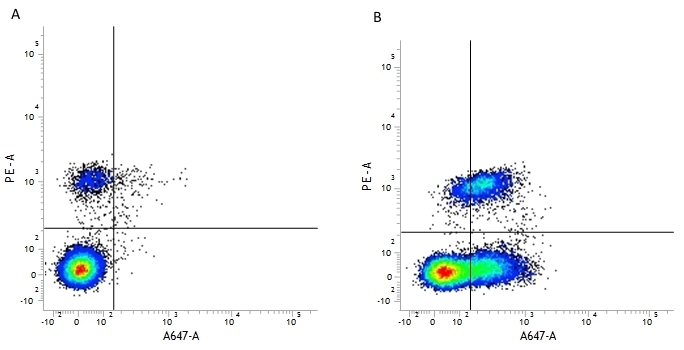 Mouse anti Human CD54 antibody, clone 15.2 (MCA1615GA) used for the evaluation of ICAM-1 (CD54) expression on NK cells of differing origins by flow cytometry. 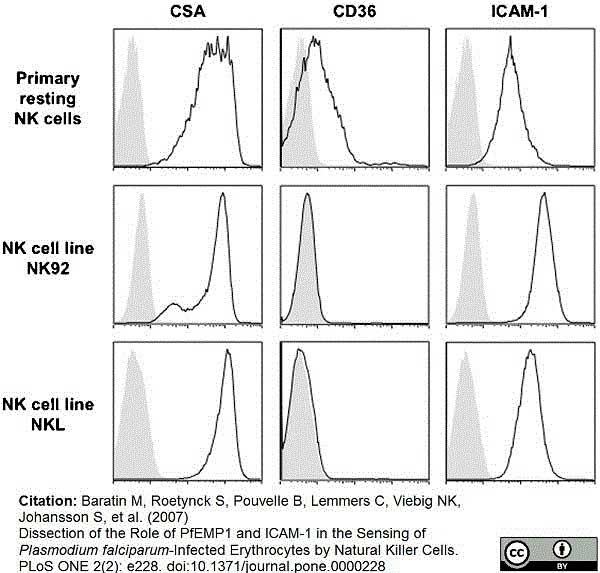 Primary resting human NK cells (CD56+CD3−) in total PBMC as well as human NK cell lines, NK92 and NKL were analyzed by flow cytometry to determine the surface expression of three host ligands for PfEMP1: CSA (left panels, dark line), CD36 (middle panels, dark line) and ICAM-1 (right panels, dark line). Stainings with isotype control for each antibody are represented by filled grey histograms. Stainings of primary resting human NK cells are representative of at least 3 donors. Mouse anti Human CD54 antibody, clone 15.2 (MCA1615GA) used to demonstrate co-localization of endogenous ICAM-1 with ICAM-1 GFP in human endothelial cells by immunofluorescence. ICAM-1-GFP co-localizes with endogenous ICAM-1 and associates to filamin and actin upon clustering. (A) TNF-α-stimulated endothelium was transiently transfected with ICAM-1-GFP, fixed and stained for ICAM-1-GFP in green, endogenous ICAM-1 in red. Merge shows co-localization in yellow and F-actin is in grayscale. Images were taken from the apical surface (upper panel) and at the baso-lateral plane (lower panel). Bars, 50 μm. (B) Beads, coated with ICAM-1 Ab, were allowed to adhere for 30 minutes to TNF-α-stimulated HUVECs. ICAM-1 was stained using an ICAM-1 Ab that is directly labelled with ALEXA 647. The results show that ICAM-1-GFP (green) and endogenous ICAM-1 (red) co-localize (Arrowheads; Merge in yellow) at sites of bead adhesion. DIC image shows localization of the beads. Images were taken from the apical surface (upper panel) and at the baso-lateral plane (lower panel). Bars, 10 μm. (C) ICAM-1-GFP was transfected into HeLa cells and anti-ICAM-1-coated magnetic beads were allowed to adhere for 30 minutes, resulting in clustering of ICAM-1, after which the cells were lysed ands treated as described in the legend of figure 2C. 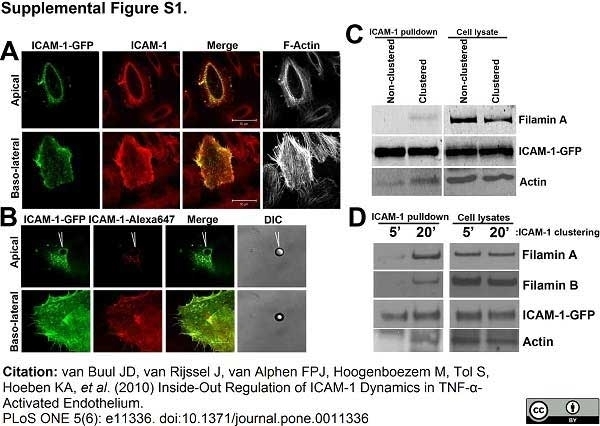 The images on the left show that the magnetic beads efficiently precipitated ICAM-1-GFP and that ICAM-1 clustering resulted in the recruitment of actin and filamin A. Images on the right show the expression of indicated proteins in the cell lysates. (D) ICAM-1-GFP was transfected into HeLa cells and anti-ICAM-1-coated magnetic beads were allowed to adhere for 5 or 20 minutes, as indicated. ICAM-1 was precipitated at both time points, whereas actin and filamin A and B were associated to ICAM-1 only after 20 minutes of clustering. Images on the right show the expression of indicated proteins in the cell lysates. Inside-Out Regulation of ICAM-1 Dynamics in TNF-α-Activated Endothelium. 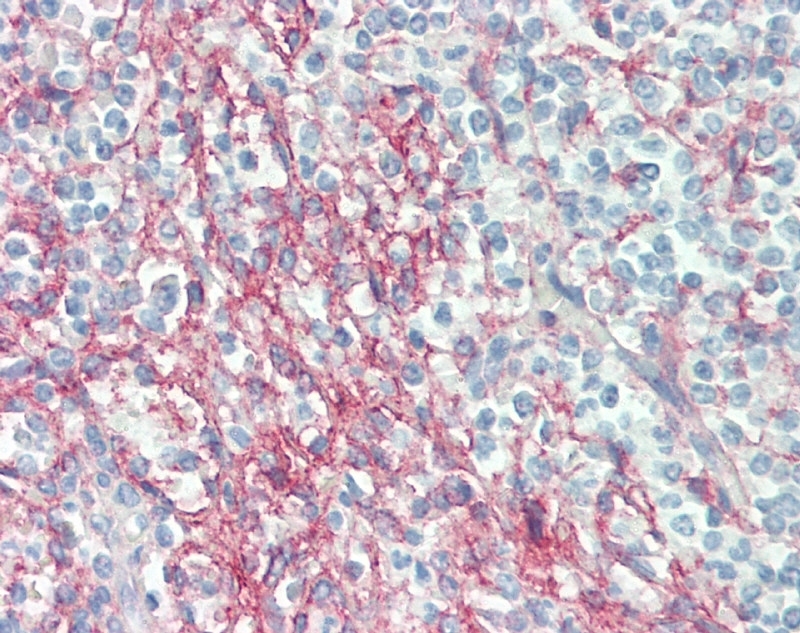 FFPE human spleen stained with Mouse Anti-Human CD54 (MCA1615GA), biotinylated Anti-Mouse IgG and Streptavidin Alkaline Phosphatase (red). Nuclei were counterstained with hematoxylin. Figure A. FITC conjugated Mouse anti Human CD19 (MCA1940F) and Alexa Fluor 647 conjugated Mouse IgG1 isotype control (MCA928A647). 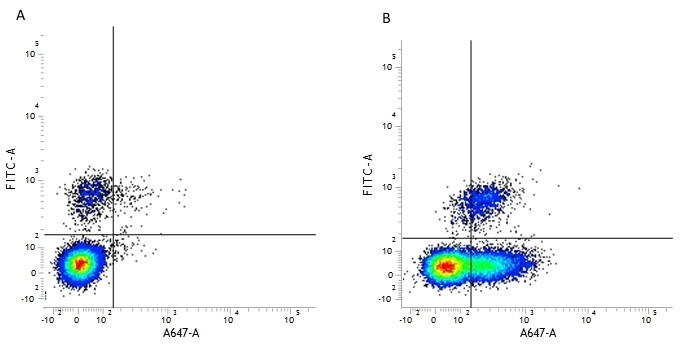 Figure B. FITC conjugated Mouse anti Human CD19 (MCA1940F) and Alexa Fluor 647 conjugated Mouse anti Human CD54 (MCA1615A647). All experiments performed on human blood gated on live single lymphocytes, in the presence of 10% human serum. Data acquired on the ZE5 Cell Analyzer. Mouse anti Human CD54 antibody, clone 15.2 recognizes the human CD54 cell surface antigen also known as intracellular Adhesion Molecule -1 (ICAM-1) or Major group rhinovirus receptor. CD54 is expressed by many cells following activation by inflammatory mediators. It is a 505 amino acid with an additional 27 amino acid signal peptide ~90 kDa single pass type I transmembrane glycoprotein bearing 5 Ig-like C2-type domains. Mouse anti Human CD54 antibody, clone 15.2 blocks CD54 function (Berendt et al. 1992). Mouse anti Human CD54 antibody, clone 15.2 binds to an epitope on the N-terminal Ig-like domain within a region designated the L43 loop (Chakravorty and Craig 2005). Dransfield, I. et al. (1992) Interaction of leukocyte integrins with ligand is necessary but not sufficient for function. Berendt, A. et al. (1992) The binding site on ICAM-1 for plasmodium falciparum-infected erythrocytes overlaps, but is distinct from, the LFA-1- binding site. J Pharmacol Exp Ther. 321 (2): 656-62. Baratin, M. et al. (2007) Dissection of the role of PfEMP1 and ICAM-1 in the sensing of Plasmodium-falciparum-infected erythrocytes by natural killer cells. van Buul, J.D. et al. (2010) Inside-out regulation of ICAM-1 dynamics in TNF-alpha-activated endothelium. Di Lorenzo, A. et al. (2011) Endothelial reticulon-4B (Nogo-B) regulates ICAM-1-mediated leukocyte transmigration and acute inflammation. Porter, J.C. and Hall, A. (2009) Epithelial ICAM-1 and ICAM-2 regulate the egression of human T cells across the bronchial epithelium. Corvaisier, M. et al. (2005) V gamma 9V delta 2 T cell response to colon carcinoma cells. Horrocks, P. et al. (2005) PfEMP1 expression is reduced on the surface of knobless Plasmodium falciparum infected erythrocytes. J Cell Sci. 118: 2507-18. Lozanoska-Ochser, B. et al. (2008) Expression of CD86 on human islet endothelial cells facilitates T cell adhesion and migration. Norling, L.V. et al. (2008) Inhibitory control of endothelial galectin-1 on in vitro and in vivo lymphocyte trafficking. Baumer, Y. et al. (2011) Telomerase-based immortalization modifies the angiogenic/inflammatory responses of human coronary artery endothelial cells. Exp Biol Med (Maywood). 236: 692-700. Lask, A. et al. (2011) TCR-independent killing of B cell malignancies by anti-third-party CTLs: the critical role of MHC-CD8 engagement. J Immunol. 187 (4): 2006-14. Sommaggio, R. et al. (2012) Multiple Receptors Trigger Human NK Cell-Mediated Cytotoxicity against Porcine Chondrocytes. Murphy, A.J. et al. (2013) Anti-inflammatory functions of apolipoprotein a-I and high-density lipoprotein are preserved in trimeric apolipoprotein a-I. J Pharmacol Exp Ther. 344: 41-9. Sumagin R et al. (2014) Transmigrated neutrophils in the intestinal lumen engage ICAM-1 to regulate the epithelial barrier and neutrophil recruitment. Mucosal Immunol. 7 (4): 905-15. Sugden SM et al. (2017) HIV-1 Vpu Downmodulates ICAM-1 Expression, Resulting in Decreased Killing of Infected CD4+ T Cells by NK Cells. J Virol. 91 (8): pii: e02442-16. Lennartz, F. et al. (2015) Mapping the Binding Site of a Cross-Reactive Plasmodium falciparum PfEMP1 Monoclonal Antibody Inhibitory of ICAM-1 Binding. J Immunol. 195 (7): 3273-83.